July 22nd the Tucson Jewish Community Center (JCC) had its first Sparks Pupsicle Party, where pups and people alike enjoyed some frozen sweets to beat the heat. 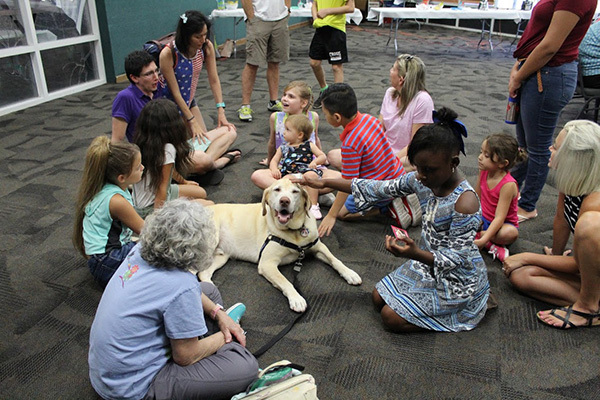 This event brought therapy dogs, their handlers, and other families to the JCC for an exciting popsicle-making activity. Allison Wexler, the event’s organizer and Tucson JCC Special Abilities Coordinator, said it was “designed for people with disabilities, but open to all.” While this was the first Pupsicle event they have held, Allison says that it may become a yearly activity due to its apparent popularity. The event was funded through the Jewish Community Foun-dation of Southern Arizona and Jewish Federation of Southern Arizona Aligned Grants Process. Because the Pupsicle Party was grant-funded, participation fees were minimal and covered the expenses of the event, without yielding profit. The Sparks Pupsicle Party would not have been possible without the Sparks Club. The Club is an all-inclusive social program, which provides a welcoming environment and regular meetings to encourage members to socialize and integrate into the Tucson community. The Sparks have visited residents at Handmaker Assisted Living and helped walk their dogs; they’ve gone on trips to the mall, and held community luncheons. The Sparks had an event attended by local farm, Hoofs N Horns, which brought a few goats and sheep to play for the day. Starting in October, the Sparks will be meeting every Sunday for a new activity. One of the Sparks’ most well known projects is the Sparks Cheer team. Sparks Cheer is an adaptive, co-ed athletic program, which accommodates all ages and abilities. Cheerleaders range from age three to thirty six. Sparks Cheer recently welcomed its first four-legged cheerleader, Yofi, to the team. Yofi is a hypoallergenic Goldendoodle, and a certified therapy dog. She has been working diligently to learn new tricks for her team’s cheer performances including spinning, barking on command, and crossing her paws with the other cheerleaders’ motions. According to Yofi’s handler and owner, Judy, Yofi always perks up when she sees her Sparks Cheer t-shirt being taken out. Yofi lifts her paws excitedly, eager to put on the uniform she associates with visiting her teammates. Yofi was one of the therapy dogs at the Sparks Pupsicle Party, where she celebrated her second birthday surrounded by beloved friends and peanut butter Pupsicles! 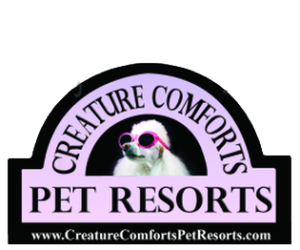 Judy thanked Yofi’s trainer, Jeremy Brown, owner of The Complete Canine, for helping them improve throughout training. Yofi was 8 months old when Judy bonded with her. Judy was always interested in getting Yofi certified as a therapy dog, but it wasn’t until Yofi miraculously survived an accident, during which she spent 24 hours alone in the desert that Judy said, “I knew she had a higher purpose.” Yofi and Judy have trained through all levels of obedience and therapy classes. Three other handler and therapy dog teams attended the Pupsicle Party, and there were around twenty human participants. 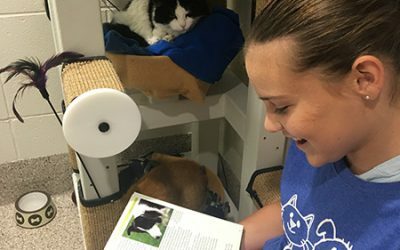 Participants were split into two groups: one made the dog and human-friendly “pupsicles,” while the other group socialized and fed a premade batch to the pups. These special frozen treats blend peanut butter, low fat yogurt, and bananas to create a tasty snack for dogs and humans alike. After the groups switched activities, all the participants got to enjoy their choice of a store-bought popsicle or a pupsicle. 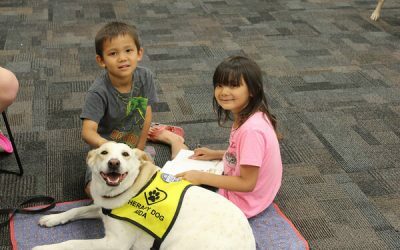 Although the therapy dogs in attendance were certified through different organizations, they are connected by affiliation with a new therapy dog group in Tucson, Kiernan’s Kindness. 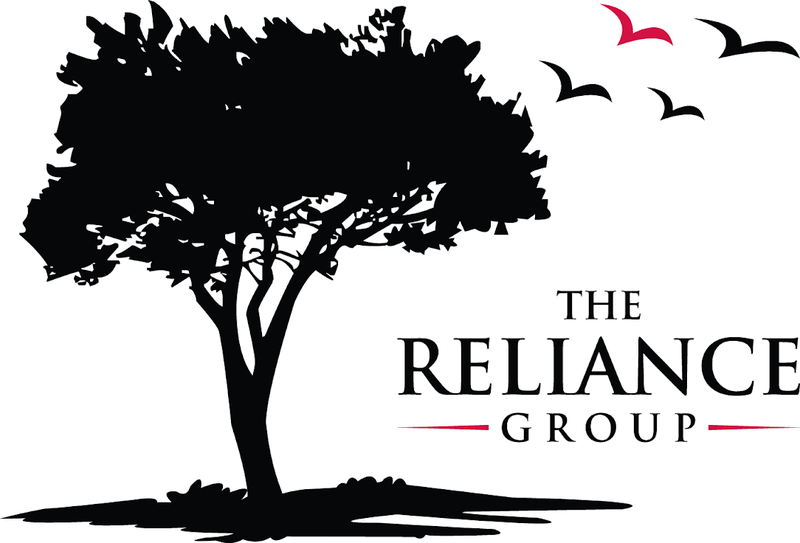 The group, founded by Jeremy Brown, was started to commemorate the life of a beloved young woman named Kiernan. Its mission is to spread love and generosity throughout the Tucson community, just as she did. 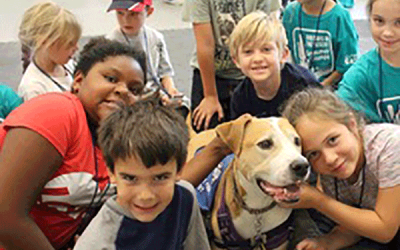 Bringing therapy dogs to various events in our city is just one way the group achieves the Kiernan’s Kindness mission. For Judy, the most rewarding part of taking Yofi to community events, like the Sparks Pupsicle Party, is getting to experience the kids and therapy dogs “sharing a moment of joy together.” She believes the Sparks events are a wonderful place for Yofi to bond with her fellow cheerleaders and their families outside of practice, as well as to meet new people and dogs that attend.